My alarm went off at 2:20 this morning. Why? So I could get up and watch the very first National Championship of college football that started at 2:30 AM our time here in Czech. There's no question about who I was rooting for! 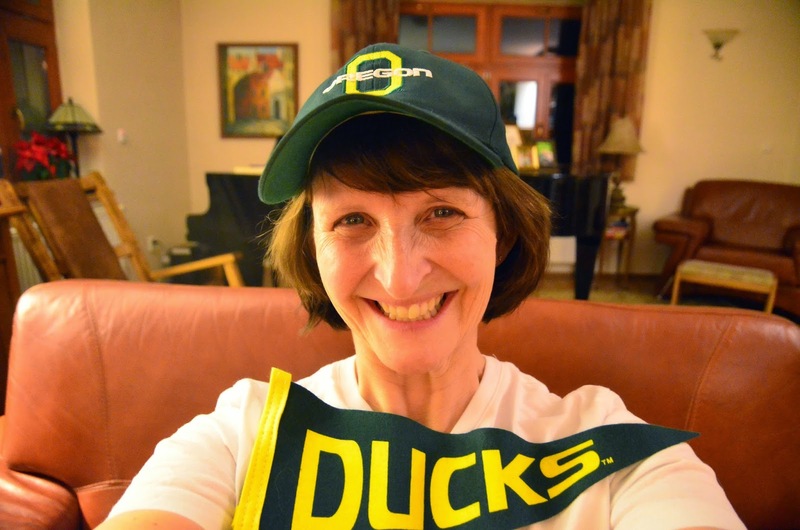 I was born and raised in Duck country, Eugene, Oregon. I also attended the University of Oregon and my parents still live in Eugene. So I'm as genuine of a fan as you can get! But it was a tough game to watch. Since I don't follow any other football (or sport, for that matter! ), I wasn't used to the tension and adrenaline that I was feeling, especially in the middle of the night. Trust me, my eyes never drooped once! There was certainly enough action to keep it interesting the entire game. Although the Ducks were the first to score which was so exciting, Ohio State soon passed them up and stayed in control the rest of the game. They played well and the result was a fair one. I stayed up right till the end, not about to give up on my Ducks until the game was over. But in the end, it was Ohio winning the game, 42-20. I'm not sad I got up for the game, even though my team lost. It was fun to join in with all my other family and friends around the world who were watching, and enjoy a good game of football. Now to catch a few more hours of sleep while it's still dark! That's hilarious. You are indeed a true fan! It was a bit disappointing but I think I'm mostly over it by now and can actually leave a comment. I was actually thinking quite a bit about your time at the U of O when I was house sitting. The Walton complex was right on my daily walking path and I just kept thinking how you were right on campus and across from Hayward field. I know you worked concessions for the football games too if I remember correctly! I'm only a Duck wanna be and you are actually the real thing!